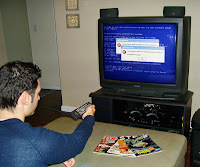 Although the commercials crashed nearly every available brand of plasma and LCD television, as well as afflicting older cathode-ray models, Microsoft spokesperson Sarah Machen insisted that the problem was not her company’s fault, and that it likely resulted from low memory, a fragmented disk, or perhaps an outdated video card. A press release issued by the software giant also advised televisions users to avoid quickly switching back and forth between programs to prevent any future crashes. Namaste to Jim T. for the link.